NeverSeconds: Hello Pavlova from Perth, Australia! Pavlova: That looks a very scrummy lunch. Steven: I can see why gingerbeer is in the red list. 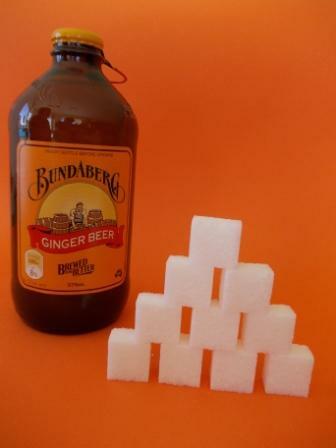 Ginger beer is a favorite of mine, and like you I would drink it every day if I could - I love the taste of ginger - the one I drink has 31g of sugar though - so it's a treat, not something I can drink very often. 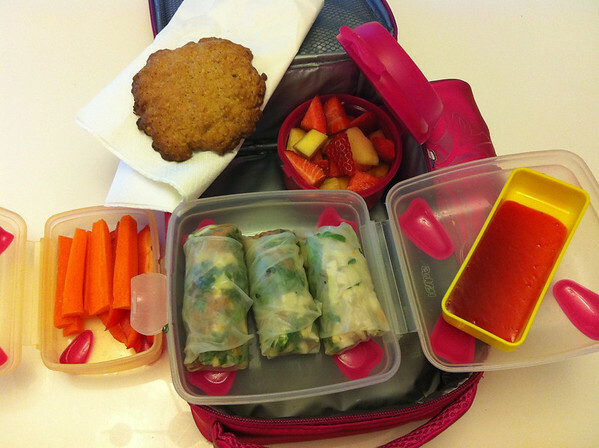 Your lunch looks yummy and i am very fond of Vietnamese Spring Rolls. They are a fun way to add more veggies and herbs to a meal! showcase to the bountiful fruits of Australia? Yum! Thank you for writing, I look forward to reading more! LOVEING the mix up of different schools and the random lunches from around the world. I am enjoying how everyone has thrown in their own little twists and it is good to see that new people are starting to follow it daily. Keep up the good work! And it's also incredible how much sugar is in just one bottle of soda. That's an interesting project, William! I'd like to see more photos like that. I am going to guess that you are a dancer, probably a ballerina. That, or you chose the name because you are a big fan of the dessert which was named after the dancer. Those spring rolls look AMAZING! I have never had Vietnamese food, but a new place just opened up near me and seeing your lunch I now am determined to try it! Hello from Canberra, an Australian place not named after anywhere in the British Isles, but from the Aboriginal word for "meeting place", because people gathered here - for many tens of thousands of years - to prepare to harvest Bogong moths which flew to the nearby high country in massive clouds to escape the summer heat of the western plains. The ginger beer looks great...even though it has a lot of sugar. Ginger itself is actually really healthy. It is a natural anti-inflammatory, natural pain reliever...and is super helpful for nausea or upset stomach. So the benefits may outweigh the negatives in this case. Also, I would love to have that lovely lunch pictured above, too! I make my own ginger ale/beer! I buy club soda or plain seltzer water and use fresh chopped or grated ginger root and sometimes I add fresh squeezed lemon juice. I do not add sugar but I suppose you could, but you might want to make a simple syrup first. As for Pavlova, I think you may be taking ballet classes? Bundaberg Ginger Beer is my favorite too! I have to buy it at a speciality store here in the US. It is pretty expensive, so always a special treat! Love your lunch Pavlova. :-) Very healthy and unique. With a nice cookie treat. That's a very tasty looking lunch! And it looks very healthy too! I'm guessing your name was chose for the meringue and fruit based dessert from Australia that, I'm told, was invented in honor I the equally famous ballet dancer from Russia, also called Pavlova. Great blog yet again, and what an amount of healthy food you have - and a picnic every school day. So you have fresh food and fresh air. Ginger beer is a very nice drink, although I try and avoid any bottled fizzy drinks. I did used to have a ginger beer plant and make my own. Perhaps I should make another one. Looking forward to some more red items as the week progresses. A great start to the week, well done!! Hi Pavlova, the thought of eating lunch on your school veranda is so appealing, please would you consider posting a pic of it or the whole school including the veranda so i can see if it's anything like i imagine. I want Vietnamese spring rolls for dinner now!